The pilot was a 60-year-old male with a commercial pilot’s licence and just over 3,000 hours flying time. He’d held a UK PPL since 1982 and had recently done aerobatic training in a Cessna 150. He’d owned a Cessna Citation (jet) as well as a variety of single and twin aircraft. The aircraft was a Piper PA-38-112 Tomahawk, a two-seater, all metal aircraft. Tomahawks were designed for flight instruction but are also popular as a touring aircraft. Part of the design brief was to build in realistic spin recovery behaviour by requiring specific pilot input to recover from a spin. A spin may be entered unintentionally or intentionally, as an outcome of unbalanced flight close to the aerodynamic stall. The PA-38 is cleared for intentional spins provided that a full four-point shoulder harness is fitted and the flaps are fully retracted. A series of flight tests were carried out October 1979 by NASA Langley Research Center, to evaluate PA-38 Tomahawk spin behaviour and recovery. From these tests, the average rate of descent was calculated to be of the order of 5,000 ft/min to 6,000 ft/min. The pilot leased the aircraft for a three-month period starting in early June. The aircraft was given a 50-hour inspection on 4 June before being handed over to the pilot two days later. The lease allowed the pilot to use the aircraft for 50 flight hours or three months, whichever occurred first. There would only have been a few weeks left on the lease. He kept the aircraft at Elstree Aerodrome and flew it regularly on local flights. He flew to other local airfields, sometimes flying around the area before landing. He’d flown approximately 20 hours in the aircraft to airfields and helicopter landing sites in the south-east of England, with an average distance of about 60 nautical miles. He had an iPad mini which he used to track his flights. That morning, there were 32 other recorded flights which tracked his GPS movements from initial taxi to parking. On Wednesday, the 20th of August, he arrived at Elstree early. The weather was good and the skies were clear, a perfect day for flying. He departed the airfield at 09:33 and flew to Turweston Aerodrome. He landed at 11:26 after flying circling manoeuvres just to the south of Buckingham. He sent one SMS during this time, which wasn’t related to the flight. He tracked the flight on his iPad mini and stopped tracking after the aircraft had landed. He spent half an hour on the ground at Turweston, where he spoke to acquaintances and refuelled the aircraft with 40 litres (10.5 US gallons) of Avgas. He was described as chatty, friendly and relaxed. He departed 11:56 and landed at White Waltham at 13:00, again tracking the full flight until after landing. He spent some time at White Waltham and then booked out for a flight to Elstree. So far it had been a normal flying day that matched his others. However, then it got odd. He filled in the booking sheet to confirm that he was departing at 17:00. But five minutes before he was due to leave, he phoned Elstree Tower and told them that he would not be returning that day. He didn’t mention a new destination to anyone at White Waltham and he did not update his booking sheet. He went to the aircraft where he discovered that the battery was flat, because he’d left the Master switch on. He spoke to the airport office and personnel from one of the maintenance organisations at White Waltham came out with a battery booster starting aid. They told the pilot that typically after an hour of flight time, the battery would be fine. It was 17:08 when he took off from White Waltham and headed north. He tried to make a phone call but wasn’t able to get a network connection. A few minutes later he reached 2,200 feet and made several phone calls, each lasting about two minutes. He was south of Buckingham when he climbed to 2,800 feet started flying in approximate circular patterns with a 2-3 nautical mile radius, similar to the flights he’d done that morning. He phoned the same person he’d spoken to earlier in the flight and the phone call lasted for about 90 seconds. The pilot then made a series of phone calls to another person which were only connected briefly before the calls ended, which was likely connectivity problems. The Class A airspace above him started at 5,500 feet and he remained clear of it, flying patterns between 2,500 feet and 4,700 feet for almost an hour. At 18:22:54, the track logging on his iPad ended. At 18:31, he attempted to call a relative but the call didn’t connect. Twenty-five seconds later, he sent a text message to the same relative. The full message was 148 characters and the aircraft at that time was about 1.8 nautical miles north of the crash site. At the time of the message, the aircraft’s groundspeed was approximately 64 knots and it gradually turned to the left over the next 49 seconds. MAYDAY MAYDAY MAYDAY. Golf Bravo November Delta Echo er lost control of the aircraft and it’s gone into a spin. The transmission lasted about 8 seconds. The controller responded asking the pilot to set 7700 on the transponder. The pilot confirmed his approximate position before saying “I can’t control it” at 18:34:07. That was his last transmission. Witnesses near Padbury saw the aircraft enter a descending spiral from what appeared to be normal flight. Others first noticed it when it was already fast descending in a spin or spiral. Several witnesses heard the engine running. The aircraft impacted the ground at Hedges Farm. When emergency services arrived, the aircraft was upright on a grassy area at the edge of a field and the smell of Avgas was in the air. The tail was lying against a hedge. The wreckage showed that the aircraft struck the ground in a left spin at a high vertical descent rate. There was a “sputtering” noise coming from the aircraft which ceased after a member of the fire crew turned off switches. The fuel tanks were punctured on impact and the fuel drained into the ground beneath the engine. The fuel selector was set to halfway between OFF and LEFT. Cause of the death was the injuries sustained in the impact. There was no evidence of drugs or alcohol. He did not show signs of any disease which could have caused his death or contributed to his losing control of the aircraft. It was obvious that the aircraft had entered a spin from which it never recovered. The investigators focused on weather, training issues or mechanical defect which could have caused or been a contributing factor to the spin. The weather was clear and the pilot was in visual conditions throughout. The pilot was experienced and had taken lessons in aerobatics, which would have included spin awareness and recovery. It seems likely that he would have been able to recover from a spin which, based on the final radio transmissions and the calculated rate of descent, started from at least 2,500 feet and probably higher. There was no evidence of engine failure at all, other than that the propeller showed little evidence of power at impact. The primarly flying controls showed no evidence of a pre-impact disconnect. The fuel selector setting may have been moved by the fire crew member who turned off switches but investigators felt it was more likely that the pilot had attempted to turn off the fuel. The “sputtering” noise was likely the gyroscope or the electric fuel boost pump, which means the battery held a reasonable charge at the point of impact. They were unable to find any mechanical defect that could have been a factor. There was no sound of the stall warner during the MAYDAY call, although in test conditions, the horn would sound intermittently while the aircraft was spinning. There were two mobile phones and the iPad in the aircraft. 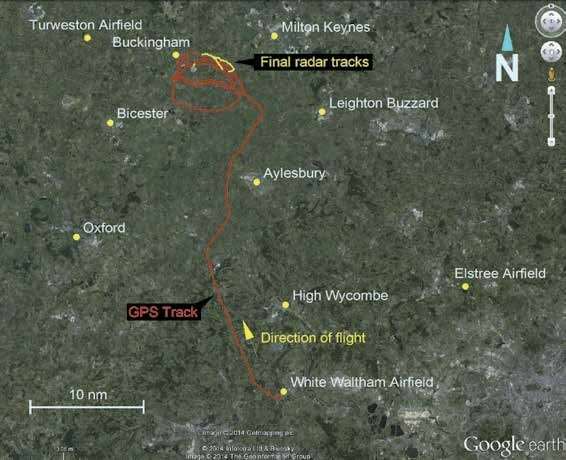 The final flight was recorded on the iPad, as the pilot’s other flights had been, with the recording starting at 16:53 at White Waltham Airfield when he was still parked. However, no active route had been selected for the accident flight and the recording was stopped at 18:22:54, eleven minutes before the aircraft disappeared from radar. The system logs the date and time if the battery dies. The data file was dated two days after the accident, which shows that the iPad computer was running at the time of the impact. He had never before used the two mobile phones on board for phone calls during flight and he’d only once before sent an SMS, that morning on the way to Turweston. The final text, informing his relative that the aircraft was going down, was sent 25 seconds after the attempted phone call. It would “require considerable dexterity,” as the report says, to send a 148-character message that quickly in an aircraft that was out of control. The aircraft flew for over two minutes after this text message in which he said he did not expect to survive. In addition, the radar track of the aircraft shows that he had control of lateral flight when the message was sent. The aircraft then changed track at the same time as the pilot transmitted his MAYDAY message in which he claimed he was in a spin. I don’t expect the verdict to come as a surprise to anyone who has read the AAIB report. Sorry but nobody in a desperate situation has time to text such a long message and then use the radio. This was attention seeking behaviour, ie suicide. Simon, sadly I can only agree with you. The bizarre pattern of the flight, it would seem, can only be explained if the pilot was intending to commit suicide. We can however only speculate. Light aircraft do not carry a FDR or CVR. But a lot of the last activities of this pilot can be reconstructed from the mobile phone conversations and attempt to make connections. Did he intend to make a last farewell call to a relative who did not answer ? We can only speculate. Just like to prolonged circling poses questions: did the pilot delay his suicide to gather courage ? Did he want to make a last call to someone ? No doubt investigators will come up with some answers. The most obvious question to be asked: was this pilot in some kind of trouble ? Sylvia mentioned that he had previously owned a Citation. It would seem to indicate that he had been wealthy at some point. All we can do is, if we are religious, is say a prayer for him. At least he decided to go alone, not to take a lot of innocent people with him. Circling can be explained as making sure the battery was fully recharged before landing so he wouldn’t have any trouble on his next trip. As for the rest… I can’t see any other explanation than suicide, but *please* don’t call it “attention-seeking behavior”. That’s a massive slap in the face of anyone who has experienced depression and suicidal ideation. Yes, my feeling initially was that of course he would circle for an hour to get the battery charged up. But then, there’s too much else that doesn’t fit in with that. It seems hard to argue that the pilot decided he was going to go into a fatal spin before he was ever in one. I also agree that attention-seeking behaviour is the wrong phrase. Rudy, the investigation is closed. I’m watching for the coroner report but it may well record an open verdict. You are correct in that the pilot had been wealthy. However, there was nothing obvious that I could see that would cause him to give up now. There is no other way to describe that than attention seeking. Likewise with Lubitz before crashing the German Wings flight he told his girlfriend that he was going to do something so that his name was never forgotten. “Attention seeking” is perhaps a kind way to describe it. Extreme narcissism is more accurate. Why does a pilot make several attempts to call and text people he knows to declare an emergency when he had a perfectly good radio? I am sorry, but I am not into being an apologist for mental illness. Call a spade a spade. I don’t think it is about being an apologist. Extreme narcissists don’t take their own lives, they are much too important to do so. There’s a big question as to what he was doing on the phone and your opinion about it is valid. I’m happier with your choice of phrase alongside your interpretation of his actions rather than as a blanket statement. From a mental illness point of view, it is not a good description of people suffering from depression and it actively discourages people with suicidal thoughts from asking for help, because they are worried they will be accused of attention seeking. It’s a very odd story. He qualified as a pilot in 1982 and had a lot of experience. So, assuming it was a planned suicide, he would have been well aware that his “accident” would be investigated in great detail just like any air incident. So I don’t get why he sent the text and turned the iPad off. Did he really think the investigators would not be able to piece it all together? I would love to see a follow-up post after the inquest, which may well divulge background information about the pilot and his personal circumstances.